Although the elven jewel-smiths used knowledge gained from Sauron to make the Rings, Elrond informs us that the three elven Rings – Vylya, worn by Elrond; Nenya, worn by Galadriel; and Narya the Great, worn by Gandalf – “were not made by Sauron, nor did he ever touch them”. Similarly, the elves never handled Sauron´s Ring. It was forged in secret in the Mountain of fire (Mount Doom) by Sauron himself. Sauron did have a hand in forging the Rings of the dwarves and humans, however, and as a result, they had the power to corrupt that the elven rings did not. The One Ring is a Ring of Power. Indeed, it is the ruling Ring of Power. The Hobbit is the prequel to J.R.R. 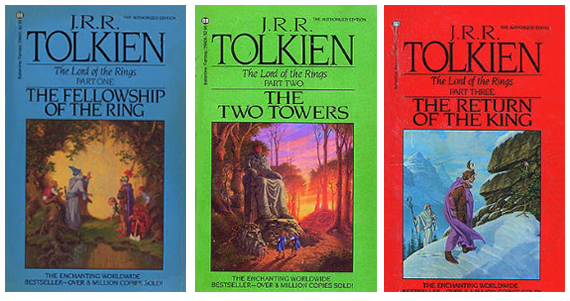 Tolkien´s famous trilogy The Lord of the Rings. My pop culture file on The Hobbit can therefore be seen as part one, where this file is part two. Where part one was about the desire for things (Smaug´s treasure), part two is about the desire itself (the Ring of Power). It is clear enough that the one who wants power is the Ego. The Ego wants. The backside of this Ego-centredness is radical Ego-sovereignty. So the Ego, the desire, the power, and the inevitable resulting violence, are combined in the dark collective primordial images and fantasies. This is the circle of the One Ring. The lines inscribed on the Ring (in boldface above) were pronounced by Sauron when he forged the Ring. The Elven smiths heard him chanting them, and thereupon became aware of his purpose and took off their own Rings to foil his plan. A person wearing the Ring would enter a shadowy world revealing the physical world from a different aspect, from which physical objects were harder to see. The wearer was mostly invisible to ordinary beings, such as Men, but highly visible to the Nazgûl. The Ring dimmed the wearer's sight, while at the same time sharpening the other senses; that is: the wearer entered into the world of dark collective primordial images and fantasies; the backside of the wearer´s Ego-centredness: the radical Ego-sovereignty, which the Ring offered. Because the Ego wants. One of the clearest moral lessons in The Hobbit is the importance of keeping “precious” things like golden rings, fabulous jewels, and dragon´s treasure in proper ethical perspective. Through his vivid portrayal of possessive characters, such as Gollum, Smaug, Thorin, and the Master of Lake-town, Tolkien cautions his young readers about the dangers of excessive materialism and greed. Gollum provides an extreme example of the isolating effects of all-consuming possessiveness. He lives alone and friendless on an island in the middle of a dark, cold subterranean lake. In The Lord of the Rings, we learn that Gollum acquired the One Ring by an act of murderous desire, that he used the ring to steal and commit other wicked deeds, and that he was eventually driven out of his community by his grandmother. By the time Bilbo Baggins encounters him, he has lived alone in the Misty Mountains for more than 450 years. All that time, the lust for the ring slowly ate away at Gollum´s mind and corrupted his will. Even Bilbo, despite Gollum´s black-hearted treachery, couldn´t help feeling a “pity mixed with horror” as he contemplated Gollum´s sad, lonely, comfortless life. Gollum, we´re told, “had brooded for ages on [the Ring], and he was afraid of it´s being stolen.” He “used to wear it at first, till it tired him; and then he kept it in a pouch next to his skin, till it galled him; and now usually he hid it in the rock on his island, and he was always going back to look at it.” The development from The Hobbit, where the theme was the desire for things, to The Lord of the Rings, is that the theme has become the One Ring, or the will to power in itself. As elven-lore tells us, the One Ring gives its wearer dominion over other powerful Rings. When Sauron, the Dark Lord of Mordor, forged the One Ring, he infused it with his own malevolent power. There were other, lesser rings, but Sauron saw to it that the Ring “contained the powers of all the others, and controlled them, so that its wearer could see the thoughts of all those that used the lesser rings, could govern all that they did, and in the end could utterly enslave them”. By infusing the Ring with much of his own power, however, Sauron was gambling. For if one with sufficient knowledge and power were to gain possession of it, the Dark Lord could be overthrown. But who in Middle-earth would challenge him? Indeed, who could challenge him? Of course, if the Ring were actually destroyed, his power which he had infused in it would be lost. He himself “would be diminished to vanishing point, and…reduced to a shadow, a mere memory of malicious will”. Still, the Ring could be destroyed only in the fires of Mount Doom. More significantly, those who used the Ring came under its sway, eventually becoming dominated by it. And those dominated by it could not bring themselves to destroy it. Its destruction thus seemed highly unlikely. So perhaps Sauron´s gamble was not an overly risky one. At any rate, his desire to dominate, enslave, and establish his will over Middle-earth ultimately outweighed the risk. Ilúvatar, also called Eru, is the one true God, creator of Middle-earth. During the long conflict between light and darkness, the Dark Lord Sauron takes for himself the title “King of Kings and Lord of the World,” a title rightfully claimed only by Ilúvator himself. Moreover, in seeking to subjugate the whole world, Sauron seeks to supplant Ilúvatar, thus making himself God. Tolkien explains that he sees the fundamental conflict in The Lord of the Rings as not about “freedom,” though that is certainly involved, but about “God and His sole right to divine honour.” (Soli Deo Gloria). Sauron desired to be a God-King, and was held to be this by his servants; if he had been victorious he would have demanded divine honour from all rational creatures and absolute temporal power over the whole world. Thus, the conflict in Middle-earth is essential religious. Sauron seeks to establish his will not only over his fellow creatures in Middle-earth but ultimately over Ilúvatar himself. Sauron´s quest to dominate, enslave, and establish his will over all others – even Ilúvitar – makes him the arch-enemy of all that is good in Middle-earth. Still, while it represents a deadly threat to others, the Dark Lord´s power play represents to him the hope not merely of life but of abundant life. German philosopher Friedrich Nietzsche was an outspoken supporter of the quest for power. For life, according to Nietzsche, is all about suppression of the weak by the strong. “Exploitation,” he states, “does not pertain to a corrupt or imperfect or primitive society: it pertains to the essence of the living thing as a fundamental organic function, it is a consequence of the intrinsic will to power which is precisely the will of life.” There are a lot of attempts of justifying Nietzsche, and a lot of his philosophy of life is also noteworthy, but my final view is simple: if exploitation is indeed the essence of life, no denizen of Middle-earth is more alive than Sauron! Nietzsche’s point of view is unavoidable a justification of the immoral life. So the question becomes: if a mortal being – a human or a hobbit, for example – possesses a Ring of Power, would he choose a moral life? When we ask this question, we might be concerned about the physical abilities and limitations of the possessor of the Ring. We might wonder whether a mere hobbit, such as Sam Gamgee, could wield the powers of the Ring, in the same manner as Aragorn, a human nobleman could. Would the Ring provide different kinds of power to different kinds of beings, so that some strong willed individuals – such as Aragorn – would have power to control the minds and actions of others, while weaker-willed individuals – Gollum comes to mind – would only use the Ring as a means of escape and evasion? Does the use of a Ring of Power entail any moral or ethical limits? Is there a morally right or morally wrong way to use a Ring? These questions become even more important when we consider not just any Ring of Power, but the One Ring of Sauron, for the possessor of the One Ring can wield almost unlimited power, and a being who possesses such power would seem to have little reason to concern himself with the dictates of morality. In The Lord of the Rings, J.R.R. Tolkien presents us with several clear examples of the relationship between personal choice, power, and morality. Indeed, the story of the One Ring, and Frodo´s quest to destroy it, can be seen as a modern representation of a problem in ethical thinking originally posed by the ancient Greek philosopher Plato in his classic dialogue, the Republic. Plato was also concerned with the relationship between power and morality. He tells us the story of Gyges, who finds a ring of magical power. The ring causes its wearer to be invisible. Gyges uses the ring to enter the palace, seduce the queen, and kill the king. Plato´s question to us is whether or not one should be a moral person even if one has the power to be immoral with impunity. Does immense power destroy the need to be a moral person? It is interesting to view Tolkien´s tales of the rings as a variation of this old Platonic moral problem. Sauron´s One Ring is similar to the ring of Gyges in that it gives its possessor the power to act beyond normal limits. The characters who seek to use the One Ring believe that many of their desires can be satisfied, without regard to the interests or needs of any other creature. The story of Sauron´s Ring is a representation of the idea that unlimited power cannot co-exist with morality; the Ring represents the idea that absolute power is in conflict with behaviour that respects the wishes and needs of others. But the use of Tolkien´s Ring is a matter of personal choice. One does not have to follow the example of Plato´s villain, Gyges; all beings are capable of rejecting the use of a Ring of Power. Tolkien´s characters react to the possibility of possessing the vast power of the One Ring in different ways. Gollum is utterly destroyed by his desire for the Ring. Boromir is seduced by the thought of wielding unlimited power for the good of Gondor, but Galadriel, ultimately rejects it. Tom Bombadil appears to transcend the Ring´s power entirely (I will return to him). These characters and their relationship to the use of the One Ring thus reveal to us several different answers to the question posed by Plato. We can make the personal choice to reject unlimited power and to act by the principles of morality. In this we have to use our reason. Reason has, from ancient time, been stressed as the most essential and important in Man. But modern points of views have tried to turn it upside down. Because maybe all reason only are rationalizations of desires and subconscious impulses. The sharpest critic of the tradition is probably Nietzsche. He couldn't become tired of sneering at reason and all the illusions about the Good, the True and the Beautiful, which the philosophers, with the reason, had created. While the European view of human nature through millenniums had claimed reason as the hallmark of Man, Nietzsche turns the image upside down. He wants to convert all values. And after Nietzsche Freud has been busy following the attack on reason up. Freud believes, as Nietzsche, that human reason is a weak and secondary part of the human nature. It is desires, and subconscious motives of different kind, that determine our actions, and reason is only seat for rationalizations and illusions. Desires have, as Nietzsche made aware, to do with the striving of Man, to do with the will to power and becoming; something, which more is characterized by a Dionysian desire, than by an Apollonian rationality. Desires also have, as Freud made aware, to do with the question of the consciousness in relation to the subconsciousness, including the question about the meaning of dreams. But desires have also with passion to do, the deep and incisive feeling of something, where you don't seek to achieve anything, because the feeling in itself contains fulfilment. A feeling, which not is possible without that there also is reason, clarity and awareness included in it. The most famous of Buddha´s teachings are the Deer Park Sermon which was revealed to five former Sramana companions of him in a park near modern Benares, India. Here he talked on the existential conditions, growing conditions and growth levels of Man, and, like a doctor, he made the diagnosis: ”The nature of the illness and its cause”, after which he gave guidance in how it can be healed and the medicine hereto. Shortly said ”the illness” is suffering, and the suffering´s cause is, that Man clings to impermanent and temporal things. The many desires, that can't be fulfilled, give suffering and sorrow. The medicine consists in teaching Man how to rise over the changeable world with all its desires and transient joys. In Buddha´s teaching there is in that way spoken about The Four Holy Truths: 1) Suffering. 2) The suffering´s cause. 3) Suffering can be brought to an end, and this happens through 4) The Path, namely The Eightfold Path, where correct meditation, or correct self-communing, is the last step on the path to full enlightenment, which you also could term: full objectivism. The subject, or the ego, has stepped aside, or opened itself like a flower to the sun. This is the source of reason. The Buddhist philosophy of impermanence could sound a bit like Nietzsche´s subjectivism and nihilism, and a part of it does, but the fact that the consciousness can raise above it shows an absolutism and objectivism, which by the way is the core in all spiritual traditions. Spirituality has therefore not anything to do with the subjectivism and relativism which New Age and the self-industry, deeply inspired by Nietzsche, teach. On the contrary (that´s the reason why I have termed this New Age tendency the 666 Conspiracy, a conspiracy within the Matrix Conspiracy). Desire in Buddhist context has with the symbol and its sense impression to do. Any sense impression comes with a symbol, either from within or from outside. That the symbol also can arrive from outside is due to that the object-field is a projected world-image, which is made up by symbols: the collective images of time. The desire is a feeling, which you seek satisfied. If the symbol and its sense impression not are present, there is no desire. The symbol can be an image, a person, a word, a name, a god-image, an idea, which is affecting you in one or the other direction. In The Lord of the Rings the main symbol is the One Ring. This makes you feel, that you like it or dislike it. If the sense impression is lustful, you wish to achieve, to own, to hold on to its symbol, so that this lust can continue. Now and then you change - according to the strength of the desire - the image, the god, the object. You are for instance fed up with one kind of lust, and therefore you seek a new influence, a new idea, a new symbol. You reject the old sense impression and adopt a new, with new words, new meanings, new experiences. You defend yourself against the old, and surrender to the new, which you consider as being superior, nobler and more satisfying. In that way there is in the desire both resistance and being evasive, which is implying temptation; and naturally, when you evade from a certain symbol of desire, there is always an anxiety present, the anxiety of becoming disappointed. If you as a Philosophical Globetrotter, Life Artist and Idler (a hobbit) observe the whole process of desire within yourself, you see, that there always is an object, which your mind is directed towards. What you wish is to become more affected by the object, and this process is implying resistance, temptation and discipline. The mind becomes the mechanical instrument for a process in which there is included knowledge, sense impression, conflict and desire. In this process there is created a self-image, an inner calculator, around which all desire, all striving, all forms of self-assertion turns. This inner calculator is the Ego. The Ego´s focus is the One Ring. The question for the Life Artist is whether you can neutralize this inner calculator – not the inner center for a certain desire, a certain lust or longing, but the whole structure of the desire, of longings and of hopes, which always bring along the anxiety of becoming disappointed. The more disappointed you are, the more you strengthen the Ego. The Ego is the one who says: ”It is no use with me!”; or: ”Wonderful me!” The idea of showing that Gollum is split in two parts, Gollum and Sméagol, is to show that both the denial, and the confirmation of the Ego, continues the Ego-process. The New Thought movement is characterized by having made the thought distortion Confirmation Bias into a central part of its teaching (see my article The New Thought Movement and the Law of Attraction). The Law of Attraction teachers could easily have made the One Ring a symbol for their black speech. As long as there is hope and longing it is always on the background of anxiety, and the anxiety strengthens the inner calculator. In philosophy as an art of life it is in the inner calculator the only revolution can take place, not on the surface, which only diverts the awareness from the actual in the way that Sauron´s burning Eye is turned away from the fire of Mount Doom. Philosophical seen it is therefore not interesting for the Life Artist to know who you are in a certain conflict, to know the peripheral conflicts in your nature; their content. What you want to know is why there altogether is conflict. When you ask yourself this question, you see a fundamental problem, which nothing has to do with the peripheral conflicts and their solutions. It is this central problem, which is important. And what you see is, that the actual nature of the desire, if not fully understood, inevitably must lead to conflict. There is always contradiction in the desire. You desire contradictory things – which doesn´t mean, that you must destroy the desire, oppress, tame or sublimate it – you must quite simple see that the desire itself is a contradiction. It is not the things you desire, but the nature of the desire itself, which is a contradiction. And you must understand the nature of the desire before you can understand the conflict. With ourselves we are in a condition of contradiction, and this condition is created by the desire – this, that we strive after lust, and try to avoid pain; the root of Confirmation Bias. We then see, that the desire is the root of all contradiction – to wish something on one plane of your nature, and not to wish it on another – a double-activity like Gollum´s. We don´t strain when we do something lustful, but lust brings along pain, and then we struggle in order to avoid the pain; and this is once again a waste of energy, which reduces our urge to live and our vitality. We have a couple of organical, and therefore nature-determined, wishes. But these wishes are formed by, and are expanding, due to the philosophical desire, and it is this desire we will speak about in the following. The philosophical desire corresponds to that, which Nietzsche calls the will to power. In accordance with Nietzsche reality is in its nature dynamic. It is power. The primitive force, which can be retrieved in all reality, Nietzsche calls the will to power. Power is in Nietzsche an expression of increase. The will to power is therefore a power, which discharges itself in the striving towards something more. It is, in accordance with Nietzsche, a creative power, which seeks to form, upgrade, absorb, overcome, restrain, remould etc. The will to power is a life-principle and the basic power in Man. According to Nietzsche. But precisely like Descartes and the existentialists, Nietzsche begins with a presumption he doesn´t investigate further, namely the thinking. The will to power is entirely an expression of the philosophical desire in the thinking, not an expression of reality or life itself. It is an expression of the thinking´s desire after controlling truth, happiness and reality. It is therefore I call it a philosophical desire. It is not enough to designate it as a psychological desire. But rather than being the power in reality or life itself, it is perhaps rather what could be determined as the power of unreality and lifelessness. The power in reality or life itself, and which only come to expression in the creative emptiness, is determined by the concept of passion, which I will return to. Concentration is the nature of the will to power, and it is the thinking, which concentrates itself. Something is accentuated by the mind, is being brought in focus, something else is excluded, steps in the background. Concentration is a choice. What you concentrate on, is accentuated by the expense of something else. It is a kind of isolation and exclusiveness, reserve. The enterprising concentrates because he wishes to accumulate wealth or power, and when another concentrates himself in misunderstanded meditation-exercises, it is also because he strives after achieving something, after a reward. What they both pursues is success which can give them self-confidence and a feeling of safety. The will to power has its origin in the thinking; the will to power has created our mind on the background of one or the other image of life, so that you have the observer, who is standing outside the observed. You can´t just choose to stop concentrating, because the choice is itself a result of concentration. In the supporting exercises concentration exercises are therefore combined with relaxation exercises. In that way the union of concentration and relaxation by itself develops into meditation. The images in time, both the personal and collective images (therefore the whole of mankind´s storeroom of belief and knowledge) are the common human structure of consciousness, the recognition-processes which form the inner calculator, the Ego. And as long as we don´t understand the process of the will to power, where it works from our belief and knowledge, there will necessarily rule quarrel, conflict, sorrow, and humans will be turned against humans – and this is after all what we every day are witnesses to. And it goes through The Lord of the Rings from beginning to end. If you therefore as a Life Artist realize - that is to say: if you are enough aware - that this process forms yourself from a belief, as an expression of the desire for inner safety, then your problem isn´t that you should believe this or that, but that you should disentangle yourself from the desire after safety. Can the mind then disentangle from the wish for safety? This is the problem, and not what you should believe, or how much you should believe. That would only be an expression of the urge for philosophical safety; that is: being convinced about something, when you don´t have any philosophical life-teaching and practice, and everything else in world is uncertain. To your knowledge is also connected a process which looks like the process of the will to power. We put knowledge instead of belief. ”I know, I have had an experience, it can´t be disproved; it is an experience, I completely trust it”. In all these words your knowledge comes to expression. But if you go behind your knowledge, investigate it, observe it with greater insight and more carefully, you see, that the assertion itself - that you know something - only is one more wall, which separates the observer from the observed. Behind this wall you seek refuge, comfort and safety. Therefore, the more knowledge a mind is burdened with, the more difficult it becomes to understand. The One Ring is a heavy burden to carry. As long as there is the Ego, which experiences, and which remembers the experience, then truth, or reality, is not there. Truth is not something which can be remembered, stored, be written down and then introduced. That which is accumulated is not truth. The desire after experience produces the Ego, the observer, the one who experiences, the one who accumulates and remembers. The will to power leads to, that the observer distances himself from the observed, and that the thinker places himself outside the thought. And this is unreality, falsehood. You are absent from the surroundings, and absent from your thoughts, in the sense that you are on a distance from them, they have so to speak moved outside you, where you relate theorizing, timorous, or agonized to them. The desire after becoming something, after experience, to be something more or less, divides the observer from the observed, and this was Nietzsche overlooking. But to be the paths of the desire present in passive listening, is self-knowledge, and self-knowledge is the beginning of freedom. Perhaps the most interesting being that uses the One Ring is Tom Bombadil, the Master of the Old Forest. Bombadil is, unfortunately, cut from the movie version of The Fellowship of the Ring, but readers of the book will remember the arduous journey of the four hobbits through the Old Forest, and their eventual rescue (two rescues actually) by Bombadil, a being who appears to have complete command over all the living things of the Forest. Who is Bombadil? No clear explanation is ever given in The Lord of the Rings. He is not a wizard, nor an elf, nor a mortal man. His wife, Goldberry, describes him to Frodo quite simply: “He is, as you have seen him…He is the Master of wood, water, and hill”. And Tom describes himself as “Eldest…here before the river and the trees.” He remembers the first raindrop and the first acorn, made paths before the Big People and saw the little People arriving. “He knew the dark under the stars when it was fearless – before the Dark Lord came from the Outside”. Tom is called “Iarwain Ben-adar” by Elrond during the Council, a name that means “oldest and fatherless”. Whoever he is, he is surely one of the most powerful and benign characters that the hobbits meet in their journey across Middle-earth. You might say, that if you would like to meet Tom Bombadil, then the best is to go out into the forest and stand completely immoveable and quiet, just like in meditation. Then he is coming from the Old World. If you are completely existential present in the Now, you will receive information through the universal images – you will be made transparent in wisdom. The Ego has stepped aside. You will have contact with the world of forms, as Plato formulated it. All realization is, according to Plato, in the end due to a recollection of the eternal forms, which are lying as foundation for the accidental phenomena, because we before birth had a direct view of these forms. But this doesn´t mean a return to the past. The universal images (the world of forms, the world of realization) work in synchronism with the Now, therefore they are an expression of reality. Plato´s recollection of the eternal forms is simply about returning to the Now. Precisely as Karen Blixen formulated it. She depicted precisely the universal images as the ancient, the original (see my article The Philosophy of Karen Blixen). Contrary to this the personal and collective images work in sequences in past and future, and therefore they are an expression of illusion or unreality: what Plato called the world of experience, or phenomena, the world of shadows, of reflections, and of imaginations. But it doesn't mean, that the known (or the past) is deleted, but that there is introduced a completely new dimension where you are the known present in passive listening, where the known so to speak is made transparent in being and openness. Thus Bombadil appears to be more powerful than the Ring – or at least totally unaffected by its corruption. But at the Council of Elrond Gandalf explains that Tom “is his own master. But he cannot alter the Ring itself, nor break its power over others.” If we consider the way the power of the Ring affects an individual´s moral character, then Bombadil is an anomaly. He is not corrupted by the Ring, nor does he seem to desire it. At best he is curious to see it and to see how it affects the Ring-bearer, Frodo. Bombadil does not need the Ring – he is his own master. The two characters that reject completely the power of the One Ring, Galadriel and Bombadil, are not mortal beings. Is Tolkien telling us that only immortal or divine beings can resist the power of the Ring, that mere mortals – humans like ourselves, such as Boromir – have to succumb to the temptation and corruption of the power of the Ring? To answer this question, we must examine how two hobbits – Frodo and Sam – deal with the possession of the Ring. Frodo, of course, is the Ring-bearer, the central figure and hero in The Lord of the Rings. He possesses the Ring more than any other character during the events depicted in the trilogy, and he uses the Ring more than any other character. Is he corrupted by the use of the Ring? To a certain extent, yes. Frodo´s use of the Ring becomes ever more conflicted as his journey progresses, so that ultimately he is “captured” by the power of the Ring and is unable to destroy it. Although Frodo is tempted to put on the Ring when he first encounters the Black Riders early in his journey, the first time that Frodo uses the Ring is in the House of Tom Bombadil. His motivation, in that first use, is relatively innocent: he is “perhaps a trifle annoyed” with Bombadil for treating the “perilously important” Ring in so lighthearted and carefree a manner, and so he decides to make sure the Ring is still his, for Bomdadil could have switched rings during his magical trick. Frodo clearly has confused emotions. Tolkien presents us with two tempered descriptions of Frodo´s pleasure in using the Ring. When he first put on the Ring and saw that Merry was astonished that he had disappeared, “Frodo was delighted (in a way):” Then, when Tom directed Frodo to stop the game, “Frodo laughed (trying to feel pleased), and taking off the Ring he came and sat down again.” Tolkien does not explain why Frodo was not completely delighted and pleased. Is it because of the evil power of the Ring? A virtuous individual knows that the use of the Ring is wrong, so when one uses it one is filled with the conflicting emotions of power, satisfaction, and guilt. Frodo is thus already being affected by the Ring. Frodo dons the Ring two other times in the early pages of The Fellowship of the Ring, once by “accident” in the inn at Bree, and once in the battle with the Black Riders near the summit of Weathertop. Clearly, Frodo does not consciously decide to put on the Ring while singing his song at Butterbur´s inn. So Frodo can only be blamed here for being careless, but this is a carelessness that is probably being caused by the force of the Ring. Then on Weathertop, we see that the Ring answers to the commands of others. As the Black Riders approaches Aragorn and the hobbits, Frodo´s “terror was swallowed up in a sudden temptation to put on the Ring.” Althoug he had the same desire when he was trapped in the Barrow earlier, this time the desire is different: “he longed to yield. Not with the hope of escape, or of doing anything, either good or bad: he simply felt that he must take the Ring and put it on his finger.” And of course he does yield, for “resistance became unbearable.” The Black Riders, the Nazgûl who wear the nine Rings given to the human race of men, have exerted their collective wills to force him to put on the Ring – unlike the accident at Bree – but his choice is not a free choice; it is the result of compulsion, the psychological power of other ring-bearers on the bearer of the One Ring. The next time Frodo puts on the Ring is a free choice without any hint of compulsion: he dons the Ring in order to escape from Boromir and to separate himself from the rest of the Company. Yet as he runs away he climbs to the top of Amon Hen and sits on the ancient stone throne of the kings, where he surveys the lands around him, aided by the power of the Ring. This moment is filled with danger, for Sauron senses that someone is wearing the Ring, and the Eye of the Dark Lord begins to search him out. Frodo is filled with dread and a deep psychological conflict: he resists the Eye, crying out to himself “never” but perhaps he is saying “I come to you.” “He could not tell.” Then he hears another voice urging him to take off the Ring. These two “powers” contend within him. Writhing and tormented, for a moment he is exactly balanced between them. Suddenly he was aware of himself again. Frodo, neither the Voice nor the Eye: free to choose, and with one remaining instant in which to do so. He took the Ring off his finger. Just as with Galadriel´s test, Frodo finds the power within himself to resist the force of the Ring. He overrides the power of the Ring when he becomes himself again. But he has used the Ring as a matter of conscious choice to escape danger and to gather knowledge. The Ring is having more and more of an effect on him; he is closer to becoming a wielder of the Ring, not simply its bearer. Ultimately the force of the Ring overpowers even Frodo. Throughout the long journey into the heart of Mordor, we are constantly told of the physical and psychological weight of the Ring. The closer Frodo gets to Mount Doom, the more resistant the Ring is to his will and the harder it is for Frodo to go on. But when he reaches the Cracks of Doom, he is unable to perform his mission. Sam witnesses the scene as Frodo stands before the fire and proclaims: “I have come…But I do not choose now to do what I came to do. I will not do this deed. The Ring is mine!” Then Frodo puts the Ring on his finger and vanishes. It is thus left to Gollum to wrestle with the invisible Frodo, and in a desperate attempt to grab the Ring for himself, he accidentally destroys it in the fires of Mount Doom. Gollum bites off Frodo´s finger, holds the Ring aloft and in his joy loses his footing and falls into the fire. The Ring is destroyed and Frodo is saved. While Frodo is slowly eaten away by the corruption of the Ring, his companion Sam defeats the Ring´s power in the short time that he is the Ring-bearer. Sam takes the Ring at the end of The Two Towers, for he believes Frodo to be dead and the task has fallen upon him to complete the mission of the Fellowship to destroy the Ring. But he discovers that Frodo is alive and has been captured by orcs, and he therefore abandons the overall mission in an attempt to save his master. They must understand that – Elrond and the Council, and the great Lords and Ladies with all their wisdom. Their plans have gone wrong. I can´t be their Ring-bearer. Not without Mr. Frodo. And then the clouds rolled away, and the white sun shone, and at his command the vale of Gorgoroth became a garden of flowers and trees and brought forth fruit. He had only to put on the Ring and claim it for his own, and all this could be. The one small garden of a free gardener was all his need and due, not a garden swollen to a realm; his own hands to use, not the hands of others to command. That being invisible to the culture of self-help (which in that degree is inspired by Nietzsche and his concept of the will to power) – that being unregarded, ignored, devalued, is in a culture of self-assertion a curse. I have myself experienced that in a rather special way, namely in connection with my awakening of kundalini, which throwed me out in a spiritual crisis, years of investigating this crisis, university-studies in philosophy, and the slow development of my teaching Meditation as an Art of Life - and then that, again and again, being unregarded, ignored, and devalued by my surroundings - made me think of my own life as being befelled by a curse. The kundalini power in that degree reminds me about the One Ring of power. It gives you access to the collective time, which is a very dangerous intermediate area. The temptation to here, either to become afraid, or to experiment with various possibilities (astral travels like in Peter Pan, clairvoyance, telepathy etc. etc.) is great. It is a very forceful state. The Lord of the Rings is a strikingly good description of this very poorly mapped land, and what happens to a person who has to carry the fateful burden of such an awakening. Goethe and Dante write about the collective time in ”Faust” and in ”The Divine Comedy”. Ursula Le Guin in ”The Wizard Ged”. The shamans had to dare the journey to the underground kingdoms with their shadow-inhabitants, demons and dead. And they had to handle the journey to the heavenly regions, where gods and goddesses, heros and heroines, accomodated. The mystics had to experience the descent to hell with its belonging devils, fire and sulphur and torment and suffering. And they had to handle get off to heavenly hosts of angels and light-creatures, if the temptation was as difficult to resist as the sexual impact of the devil. The creativity, and the reality-creating ability, is in the collective time set free in fascinating degree. However, you are, in this astral state, still on the plane of the collective images of time, which work in sequences in past and future, and you are in danger ending up in a spiritual crisis. A spiritual crisis is an expression of, that you, with your Ego, have followed the positive path out in the collective time, without having done the philosophical preliminary work; that is to say: the realization-work and the ethical training. The Ego will then make you lose your way in the collective time. A spiritual crisis can be expressed in two ways: 1): as suffering, often called The Dark Night of the Soul, or 2) as Ego-inflation (inflammatio). 1) If the borders to the collective time is broken down or being exceeded out of hand, for example through LSD or through one-sided development techniques, or in shock, the consciousness and the personality will slide crucial out of balance and therefore suffer. The Ego will sideways with its personal identity and life situation, suddenly experience break in of tremendous astral energies, clairvoyant abilities, visions of mythological beings, good and evil forces, various demons and angels, death and themes of rebirth, unusual light phenomena, messages from supernatural beings, memories from past lives. These experiences will, because that the Ego´s nature has not been realized, be characterized by unreality and division, anxiety of going mad and anxiety of death, or the experience of a total meaningless and dark extinct world. 2) The personality can receive informations through the break in of astral and collective energies, images and symbols: information about, what approaches human beings from outside (from other people, from chance, destiny, life etc.). However, informations through collective images are contradictory and split. Many have therefore been seduced by these colourful experiences and have remained there, with the ability to see the aura, with the ability to create images, to create in reality. When the collective time is used spiritual in genuine sense, then the Ego, in its egoistic isolating and self-affirmative function, steps aside. However, the same forces can be used for other intensions. It can be creative, Ego affirmative, political, demonical and so on. The forces which in spirituality are given to others´ disposal in healing, energy transmission and spiritual information exchange, the same forces can themselves be turned in through the Ego-structures and open creative channels, create super Egos, create political leaders and popular seducers. The problem, or the danger, does not consist in using creativity or auric abilities. It is actually a good idea to formulate the experiences creatively; the danger is, whether the Ego grows and becomes swollen on the world´s positive responses. And if the Ego gains strength, takes the honour, or blows itself up, the transformation-process of consciousness stops, the growth forward towards the goal: illumination and later enlightenment (read more about this fate in my book Lucifer Morningstar – a Philosophical Love Story). My experiences with, again and again, being devaluated, without fully knowing what was going on, caused that I went into periods with periodical alcohol-abuse which I found justification for in the works of the Beatwriters, who also were the first kinds of dropouts I felt inspired by. I could also suddenly explode in extreme anger, where I insulted a lot of people, often in my nearest family. All this of course didn´t made my situation better, and just confirmed people in the belief, that I was totally helpless, and in need of treatment. I had to go into what was going on. It was necessary for me to investigate this enormous market alongside with the development of an art of life, or a teaching about how to live in this society. And today, where I have entered into my critical "Matrix Conspiracy Phase" I´m beginning to laugh of the implicated stupidity of this ideology, and I´m glad to report, that a lot of comedians also have discovered the comical side of all this. Today I travel around in the world as a Philosophical Globetrotter, Life Artist and Idler. I campaign against the work ethic and promote liberty, autonomy and responsibility; in reality: the fine art of doing nothing. In this I take an anarchic approach to the everyday barriers that come between us and our dreams. So, today I´m in for spiritual anarchism, civil disobedience, and the right to be an idler. My own discovery of this was what finally turned my crisis into a healing and transformative spiritual practice. Instead of seeing my life as befelled by a curse, I began, deeply inspired by Karen Blixen, to realize that this might be God´s plan with me. I could begin to see the dreaming tracks and songlines in the artwork of my life. The question I had to ask, involved as I was in exploring extraordinary phenomena devalued by mainstream consciousness, was whether the burden of being disregarded by noninitiates is truly greater than the burden of trying to convince them that I had an experience that, at least by implication, made me somehow “special”. So, actually quite a long time before I discovered the philosophy of idleness, I began to adopt an Epicurean way of life. Contrary to most other Hellenistic philosophers, Epicurus was Athenian citizen. His place of birth was however on the island Samos by the seaside of Asia Minor, and on this, and on the other, cultural seen, rich islands in the eastern Aegean Sea, Epicurus came in contact with philosophical traditions, that hardly was alive in Athens; especially the thoughts of the great philosopher of nature, Democritus. Epicurus left Samos after having stepped his philosophical child-shoes on the island, and established as philosopher on the island Lesbos. However, he was banished from the island because of his viewpoints. In 307 he travelled to Athens with the mental ballast, that he was Athenian citizen; this meant that he, contrary to the other philosophical schools, had the right to own land in Athens itself. Epicurus established one of two central schools in Athens. It was in constant sharp opposition to the Stoics. I will not go deeper into the philosophical opposites, just mention, that philosophy of nature was central in Epicurus, whilst the Stoics had a concept of a god, which in them was the central. But both are common in the view of philosophy should be viewed as an art of life. Note, that avoiding debate doesn´t mean not to lead a critical dialogue in philosophical sense. Epicurus wrote critical texts, and his way of life is in itself a deeply critical attitude. In his garden he realized his own life-ideal: together with friends and pupils to live a life in silent peace and joy, in peace to cultivate his garden and his needs, afar from the world´s noise and political quarrel. As mentioned, it was a kind of philosophical commune, which stood open for all sections of population and for both sexes, and where the master with his friends practiced, what they taught. The teaching of Epicurus is in other words a way of life, a teaching, which puts undisturbed happiness and refined pleasure up as the supreme good. Precisely the way of life Sam is loving. This Epicurean attitude became a central inspiration for my own life, my teaching, my kind of philosophical counseling and cafés, which now also include The Pop Culture Files. Following this philosophy of gift economy (freely give, freely receive) all my services (including philosophical counseling and cafés) are free of charge. All my articles and books are available in free PDF Versions. Links can be found on my blog and on my website. As I mentioned in The Hobbit gift economy is also a central part of the hobbits´ philosophy of life, for example in the tradition of giving presents when one has birthday, instead of receiving them. So, I earn my living from what people give me (the “freely give, freely receive,” philosophy) and what the society can offer in form of social security benefit (which I see in the light of a kind of “Robin Hood-philosophy”). This is sometimes not very popular, but as I have mentioned, sometimes you have to be a kind of spiritual anarchist, a philosophical rebel, if you want to live in accordance with your calling in life. And not so different from how monks and nuns, or artists, always have lived. Krishnamurti said, that it would be wise to retire in the age of 40 or 45, or even younger. Not in order to enjoy the fruits of what the world can offer, or what you have gathered of wordly things, but retire in order to find yourself, to think and feel deeply, to meditate and discover reality; because then you would actually be able to help the world in quite another way, because you not are identified with it. An insider in society is namely an outsider in relation to life itself, while an outsider in relation to society, is an insider in life itself (see my article The philosophy of Krishnamurti - here you can also find his entire teachings as free downloads). Now it is time to go deep into the teaching I have developed during this period. People might get angry, and call me an idler. And they are correct. With the words of the life-philosopher and idler, Lin Yutang, I call myself an apostle of loafing (see his book The Importance of Living). But people have to remember, that I am not anymore contributing to the world´s noise and political quarrels, and therefore not to conflict, violence and war. On the contrary I try to help people to get out of this confusion. I do this by offering free philosophical counseling and cafés. Mostly this happens in Rold Forest, Denmark, which is the place I have retired to, and where I live as a simple pilgrim. But it also happens when I´m traveling. I also offer free philosophical counseling and cafés in the virtual world Second Life (read my article Me and my Avatar) as well as on Skype. Besides this my writings could be filed under what I call The Peter Pan Project - an experiment connected with all of the above-mentioned (read more about my services here). So, as an apostle of the philosophy of loafing, I am actually working quite hard. My art of living is an idle philosophy born of an idle life. And if my life raises the suspicion of lolling, then look at my actions. I am trying to help people, and are favouring a person who would react freely and incalculably to external circumstances, pitting their individual liberty against the process of society: the little man eluding the clutches of the traffic warden. And look at what the wisdom the art of loafing has given us. Chinese literary tradition is rife with the jottings of non-achievers – the cultured vagabond, the scholar recluse, the Taoist wanderer. Already in 500BC, the sage Lao Tzu recommended that one should “never be the first in the world”. Only he who is not wanted by the public can be a carefree individual, runs the Taoist adage. The importance of living is peopled with educated dropouts – for instance poets such as Su Tungpo and Tao Yüanming; Su, who sang about “the clear breeze over the river and the clear moon over the mountains”, and Tao, who sang about “the hen, which rested in the top of a mulberry tree”. So, after having followed the Beatwriters´ way of living, then the Chinese kinds of dropouts have become the new great source of inspiration in my life. No, I have retired to Rold Forest, where I participate in the joys of conversation on a moonlit night; to be in the middle of a joyful gathering of happy friends, like in Wang Hsichih´s immortal little essay The Orchid Pavilion. Only in such an art of life the magic of philosophical counseling and cafés can begin. Pilgrim at Tinker Creek is a 1974 nonfiction narrative book by American author Annie Dillard. Told from a first-person point of view, the book details an unnamed narrator's explorations near her home, and various contemplations on nature and life. The title of the book suggests a pilgrimage, and yet the narrator does not stray far from her home near the creek: the journey is metaphysical. The same was the case with Henry David Thoreau, and the same is the case with my pilgrimage in Rold Forest. And deep down in his heart, also Sam knows who he is. As Galadriel knew to remain Galadriel and to reject the Ring, Sam knows that he can never be other than the plain commonsense hobbit, Samwise Gamgee, the small and caring gardener of the Shire. Fortified by his love for Frodo, he remains true to himself and rejects the power of the Ring. In Sam´s rejection of the One Ring during his most extreme crisis we learn that the virtuous and strong-willed person can turn away from a life of evil, a life of almost unlimited power, by focusing on his or her true self. It is clear that Tolkien is demonstrating to us the progressive forces of corruption of the possession and use of the One Ring, for even Frodo, the hero of the book, succumbs to its corruption in his failure to destroy the Ring. He begins with innocent and accidental uses of the Ring´s power, but eventually gives over to its seductive power by making conscious and deliberate decisions to wear the Ring, and even, at last, not to destroy it. And as in Plato´s argument, the key feature of the corruption caused by the Ring is the corruption of the soul, the “heart,” or the personality of the wielder of the Ring. To resist the Ring is to remain oneself, to be the person you are without any extraordinary powers. All who come in contact with the Ring (except, it appears, Bombadil) lose themselves (at least momentarily) in the desire to be greater than they are.